My thoughts kept centering around the fact that in order for me to achieve Extension’s Mission, I need to be more connected with the people on campus and research stations. I need to know about their research to share with our customers. For us to be the best Land Grant University System we can be in the future, Teaching and Research need to be connected to Extension to ensure real-life problems and solutions are shared in the classroom and in research programs. There are a number of reasons but to me it comes down to relevance, success, and even if land grant institutions exist in 100 years. The original vision for the Land Grant Institution was an incredible concept! Success has been achieved as we still exist 152 years after the Morrill Act creating the land grant institution was signed and 100 years after Cooperative Extension was added to the land grant system via the Smith-Lever Act. What it boils down to is how much our world in changing regarding how people receive information and the sources from which they receive it. The following infographics tell a huge story: what happens online every 60 seconds. Look at the changes even between 2013 and 2014 in the number of new information sources and how different sources changed between the two years. Think about what this means for how Teaching, Research, and Extension continue to serve the people of Nebraska and the world. 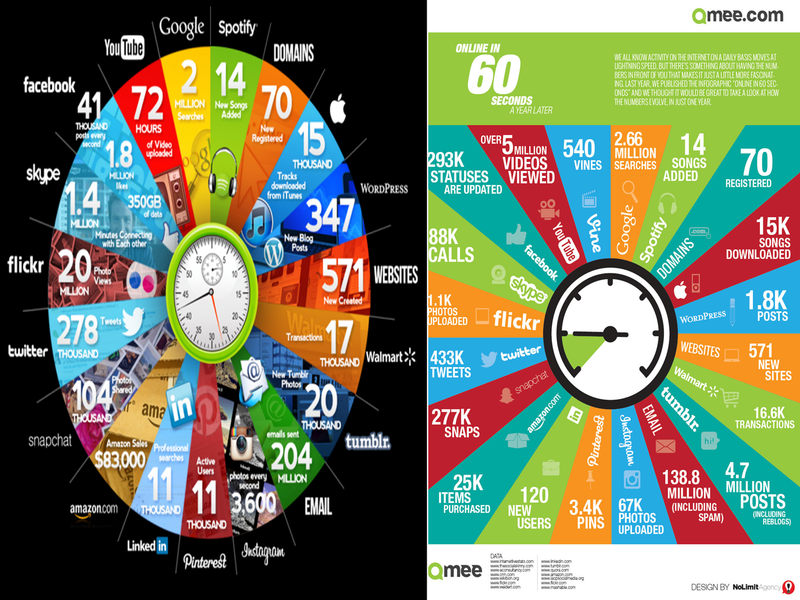 What happens online every 60 seconds (left image July 2013, right image July 2014) via Qmee.com. Click on image to enlarge. So the ultimate question for us all: How do we better connect to ensure our relevancy, our success, and our future existence? Connecting with Extension Educators out in the field to provide in-class case studies via blog posts, social media, etc. Submitting story ideas to Educators for publishing in our comprehensive Extension sites such as CropWatch, Food, Beef, Water, Horticulture. Adding UNL Extension to listservs advertising upcoming Department and Campus seminars and providing a distance connection so we can view them. Discussion: what ideas do you have for all three pillars of the land grant system to better connect? Connecting Extension and Research the Land Grant Mission. One of the things that I want to do more than any other (and you mentioned it) is to connect the classroom to the field. I see working with our students as a head start to working with our future clients. When they are in the classroom, we have the greatest opportunity to bring extension in, and start connecting the support network (to help make informed decisions) they can refer to in their careers. I have talked with Nebraska soils faculty; we want to connect case studies from the field (nutrient deficiencies, etc) and box them up in a manageable package for using in a class for students at the U, but also for the traditional extension audience (the ones with their nose to the grind stone dealing with these issues). One of the best tools we have to use on the technology side is something we already have free access to. Microsoft OneNote allows users to be connected in real time with a virtual “field notebook” that an educator could use. As an example…an educator could snap pics, video, audio, draw over images, etc., and then ask the farmer/client questions. This info goes straight into the notebook. That same notebook is shared by someone like me as well as several other educators (anyone that is invited). We start to develop these virtual notebooks easily that represent the issue, the troubleshooting process, and a way to organize it all. Then a professor could pull from these examples. The whole purpose? To give students up to date issues going on in the field, it feels relevant to them, but it also introduces the concept of extension working together with the client, the questioning process, and how real troubleshooting plays out. For the client dealing with the issue, we have a virtual connected team working on solving the issue with the next best thing to being there in person. Anyway, just a thought. This is something I will be putting significant effort in moving forward next year. Thanks Brian! Great ideas and I’m sure several of us would like to build a team around doing something like this for next year’s growing season! A few of your teaching colleagues were interested case studies using our Extension blogs-perhaps they would be interested in this concept as well using OneNote? Thanks for the comments!